our lives will twist inside out. The war is coming closer to home. Hà is a ten-year-old who lived in Vietnam with her mother and brothers before the war. The soldiers took her father, and the bloodshed came closer and closer to their home and they were forced to flee. Saigon has fallen, and Hà and her family escape with thousands of others. First a dark and smelly boat, then a refugee camp, and finally they have come to settle in Alabama. Alabama isn’t so easy. The other children pull her hair, having never seen anyone with such straight dark hair before. The neighbors don’t want to be friends, either. Everyone thinks they are too different for the small town. Hà and her brothers struggle to learn English and fit in. Their mother says they must not think of anything else, not their father or country or future, until they’ve mastered the language. She says it’s the only way they will be able to have a happy life in their new home. Though the adjustment is difficult for them all, they rely on each other, and begin the long process of healing from the wounds of the war. This double award-winner (Newbery Honor finalist AND the National Book Award recipient) is written in verse, which has the dual benefits of addressing a traumatic subject in a way appropriate for younger audiences, and gives readers a sense of Hà’s struggles to master English. This is a technique that has been used before in books like this, and works quite well-check out It seems designed for a classroom read, and could be incorporated into lessons on verse novels, the Vietnam war, or units on cultural sensitivity and bullying. I love the poem-diary format; it has the advantage of making readers feel like they are super-lightning fast because they can finish this book in a few hours! This is a haunting introduction to the horrors of war, presented in a manageable format for younger readers-good for the classroom and sure to spark conversations on bullying and diversity. Perhaps this is not a book that most young people would choose by themselves, for pleasure reading, but it would work well in a school setting. Lai, Thanhha. Inside Out and Back Again. New York: HarperCollins, 2011.262 pp. Ages 10-15. If you liked this book, try Home of the Brave, another verse novel about refugees in the United States! 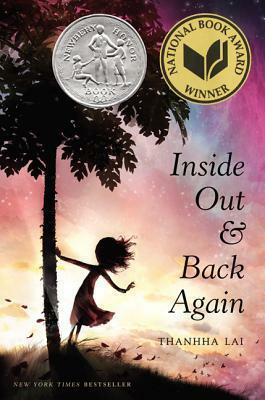 Posted on November 14, 2012 May 2, 2013 by ShannaPosted in Ages 11-14, Autobiography, National Book Award, Newbery HonorTagged Vietnam War. Previous Previous post: So, You Have To Do A Book Talk!